What’s the magic of Swagtron Hoverboard that so appeals to people and makes it tops in its class? Let’s break that down by looking at the components of its name, letter-by-letter. You don’t have to worry about getting shocked if you’re riding and it starts to rain. The power pack is completely sealed in a tough case, and Swagtron’s battery and charger have passed UL 2272 certification standards for electrical and fire hazards. It was the first self-propelled hoverboard to meet this rigorous testing standard. Swagtron Hoverboard has gone through this extensive testing process so you’ll know you’re getting a safe product. One of the first moves you’ll try when you ride is turning a circle, both forward and backwards, which is easy with Swagtron’s zero degree turns and open wheel configuration. Soon you’ll be spinning away. Standing on two legs is where you’ll likely start, but then you can expand to do tricks such as balancing on one leg, bending over while moving, squatting on the footpads or riding on your knees. Jumping off the Swagtron and back on is fairly easy, so you can vary your routine by jumping off, rolling the Swagtron and jumping back onto the footpads. With Swagtron’s range of about 12 miles, you can be adventurous in exploring your environment. Sidewalks, parks, fairgrounds and empty parking lots beckon, and you can follow your heart. Your Swagtron will go with you like a trusted friend. You can even get a made-to-fit backpack for your 22 pound Swagtron and take it with you on public transportation to travel to new locations to ride. Don’t worry if you get caught in the rain. Swagtron’s large rubber tires grip the pavement even if it’s wet. Also, the unit is water resistant, which means that the electrical system is sealed and your Swagtron will keep on running even in the rain. Swagton is gripping in another way, too. From the first ride, it will build up a grip on you, and you’ll want to ride more often, farther and do more with your Swagtron. The Swagtron constantly tantalizes you to do more. Those who are gymnastically talented can do hand or arm stands on the Swagtron. When you get really good, you might even add the upside-down splits. Sports-minded folks can use a hockey stick to bat pucks around while riding or even play basketball. If you can imagine it, the Swagtron probably can do it. The Swagtron probably will seem like a part of you before long. It is intuitive to ride, and it responds even to slight shifts in your position. It becomes so comfortable to ride that you’ll probably prefer riding it to other forms of sport travel. 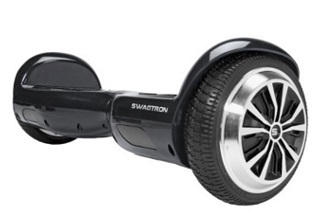 Although the Swagtron is new, at the rate they’re selling, you won’t be alone out there for very long. It’s a popular choice of gifts for people of almost any age. Riders who weigh between 40 and 220 pounds are considered candidates for riding Swagtrons, and that includes a whole lot of people. So, get ready to share the paths and excitement! We love to personalize what we own, and Swagtron owners are no different. Now there already are cool vinyl stickers and decals to dress up your ride. Whether you use the Swagtron Hoverboard as is or order skins to dress it up, there’s a lot of entertainment in such a small package.